I used the search function and found Peter Johnsson's excellent post on how to sharpen an Albion, in which he recommended an edge angle of 35 to 40 degrees (total...not each edge) for a Regent. I have been using this angle, and apparently my Regent is so dull it's taking ages to get there, even with coarse diamond stones. I've also put a shaving Edge on my Brescia Spadona at 40 degrees...and it took minutes. It was really, really wierd to shave hair off my forearm with a longsword. Very scary. Now that it's so easy to get a fantastic and perfect edge on a sword (except that darned Regent...Patrick Kelly, what did you do to it??? ) I'd like to hone the edges on the rest of my Albions. Does anyone know the recommended edge angles for the following Albions? 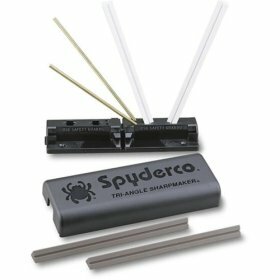 I'm using a Syderco tri-angle sharpener clamped to a table...this sharpener takes two stones and puts them in a standing V...you then hold the sword or knife vertical and run one side of the edge than the other along the stones. This assures a nearly perfect angle. I have a choice between 30 and 40 degrees. My Regent has a rather wide, flat secondary bevel to the sharpened edge, in order to maintain the original angle during sharpening you have to remove material evenly off this whole surface, looking at my blade, this would require removing a lot more material than on most swords. Considering edge angles, there's probably yet another bevel there towards the edge. Unless your Regent is very different from mine. Mine is an older one, it had the original needle-like point (which I rebated a bit), which was changed to a more robust one on later Regents. It might even be the green-gripped one shown on the Albion photo page. There is likely to be a slight convex shape to the very edge of the secondary bevel but on mine you would still want to work the entire width of the secondary bevel or you will need to re-shape this surface after a few sharpenings in order to maintain the original edge geometry. Justin, in the thread referred to, Peter Johnsson clearly says that the contact of the sharpening medium with the sword blade should only be 05 to 1mm at most. The entire bevel should not be reshaped. I started to do this myself but realised the chances of me stuffing it up were too high so very soon I am getting Peter Lyons (as he lives about half an hours drive away) to do this for me, with possibly some other customisation work on my Regent. Just at the edge and then blended in ( rounded ) in an apple seed transition: Mostly aesthetics to avoid a visible second bevel and to maintain the original style of edge for swords not intended to have a secondary bevel. Sharpening away at the entire primary bevel would normally not be a good idea although Japanese sword are sharpened this way, I believe, but need to be sharpened/polished as one operation: Even then I think a slight rounding or convex appleseed section is the end result. With a hollow ground blade like the regent there is a slight thickening of the blade just before the " secondary " edge bevel that shouldn't be ground/sharpened out as this thickening is there to give a durable edge when striking harder objects like armour. If this thickening is sharpened out the resulting edge will cut more aggressively but be less well supported and weaker resisting damage. My point was that each sharpening will make this secondary bevel slightly more obtuse unless it is reduced evenly, in other words, sharpening only the very edge will eventually change the edge geometry. One or two sharpenings like this may not make a noticeable difference but after several my point will become clear on it's own, so I need say no more. If the secondary bevel is reduced evenly, maintaining the original shape and angle (or angles on a convex edge), it does not become thinner or weaker. Yes keeping the angle the same is important to not make the edge more obtuse at each sharpening and after numerous sharpening the secondary bevel will get wider as it bites into a thicker section of blade. One can still break/round the corner of the secondary bevel to blend it into the main bevel to sort of " hide " the secondary bevel and not make it obvious. With swords one need not go overboard and resharpen too often or too aggressively just to maintain the edge. If one is trying to get rid of nicks one may have to remove more material. One thing I do is use a smooth and very had steel to just burnish the edge by itself or after some very light passes with a white ceramic or a diamond hone. My point was to not overly thin the edge or go for an extremely low angle ( opposite of obtuse ) as this makes for an easily damaged edge. Justin: I'm just adding to your comments and not disputing them at all as I agree with your points. I think we are using different words to say the same thing, Jean. I suspect that the method Albion suggests is for users who may or may not know how to sharpen already, and is intended to prevent a novice from damaging the finish by going into the main bevel. Peter Johnsson made no reference that he was qualifying the method as being for beginners only. This was simply what he noted as the correct way to sharpen a Regent that just needed the very final sharpness fine tuned. I understand what you are saying about the sharpening in relation to the blades geometry and subsequent reshaping of it due to sharpening. Removing more material over the entire surface of that final particular plane of the blades shape would make sense when undertaking drastic resharpening as required due to damage or as you say the blade having been sharpened many times previously. I didn't read Peter's post so I was answering according to my own experience, I re-did the edges on mine when I found some blunt spots that appeared to have never been fully sharpened from the Albion shop. They looked minor but trying to get them sharp by just honing on the very edge created a poorly sharpened edge in my estimation. I admit that I may be more fanatical about these things than most. I have also been getting fussy with my edges of late and have been trying to take my setup to a point where I would be able to have a constant angle as the steel is drawn across the stone. this would involve some kind of clamp. It looks like the Spyderco setup is for 30 or 40 but I would think one would be able to take these and build a rig where the triangle spyderco stones could be at any angle. You really like this Spyderco setup? Maybe I should order one. Anyone else using this? Yes, I really like the spyderco, and I think it's perfect for swords. There are some things you have to do to make it work, though. 1. You have to clamp it firly to a surface, or have someone hold it. 2. You have to hold the sword with two hands in a halbschwert position (half sword) and move it steadily towards you and down on the stone. You should do this motion as steadily as possible, so I use my body rather than my arms...it looks like I'm doing a wierd dance in front of the table. Some swords do not have consistent 40 degree edges..I tried to briefly sharpen a friend's Talhoffer and I put a 2" long razor edge on one side of the blade...the rest of the sword was just as dull as before I started. I'm going to order the diamond stones and shape it before I try again. I've had one of these for about 12 years now and I find it very good, but only really for smaller blades. I can sharpen a 12" chefs knife on it pretty well but bigger knives can be a bit of a struggle especially if they're thick. I can't sharpen my cold steel trail master or the gerber I have that has a really chunky convex ground blade. This should go without saying but I figure if I was dumb enough to do this others might too. Always, always use the brass guards that come with it. I have a nasty scar on the back of my hand where I slapped a freshly sharpened leatherworking knife into it during sharpening when I was in a hurry and couldn't find all the bits. Had five stitches in it and came with in less than a millimeter of severing the tendons that make the index and middle fingers of my left hand work. I was very very lucky to come out of it with a functional hand. No matter how much of a hurry you're in it's not worth it. I recently came across the "ozitech" knife sharpener which is a drag-through type that looks a lot better designed than most drag-through sharpeners I've seen. It appears to have been designed by someone who has a fairly good understanding of what makes a good knife edge and that sharpening != honing. It comes with diamond coated sharpening fingers as well as smoother honing fingers and has holders to bolt it to a bench. One of these fixed to a bench looks like it'd be easier to get a sword through than the spyderco one. I'd be interested to know if anyone has one and what they think of it. Maybe we should pool together a table for sharpening angles......could have it as a addition to the oakshott numbers.....and a quick and dirty clgeneral rul of thumb for the blade profiles. I have one of these now, after finding the full set on sale. It's fairly pricey but I think it works very very well. Better than the spyderco rig for kitchen knives for sure. The carbide cutter is very aggressive and needs a really light touch but is only intended for establishing the initial bevel on very blunt knives. Two light passes was all it took to reestablish a badly damaged edge on an ex-kitchen knife I got from a junk shop. It had been being used as a paint scraper. A few passes through the sharpening and honing fingers and it came out with a beautiful edge. I wouldn't go near a sword blade with the carbide cutters, but the diamond coated sharpening fingers and the honing fingers put quite an nice edge on my Knight without any noticeable evidence of establishing a secondary bevel. The down side is that there are some very light scratches on the blade near the edge either due to my being a little careless or the shape of the sharpening fingers and the sword blade meaning they touched slightly further back as well as right on the edge. They should polish out with grey scotch-brite just fine, but I'm wary of doing that because I don't want to harm the actual edge. Because this thing sharpens both sides of an edge at once I found it much easier to use than the spyderco jig. I just held the sharpening tool down with one hand and pulled the sword through with the other. The way they're made means you could just screw them to the edge of a bench too and use both hands on the sword. I think you can even buy the bit separately. I have no affiliation with the maker or any vendors, but I've since gotten two of my friends to buy the same kit for their kitchens, and they're both very happy with them too, so I recommend it, even if only for your kitchen knives.